This book is based on McAulay’s PhD thesis, although she takes advantage of a new medium to include some additional material. From the outset we are informed that this volume ‘specifically focuses on song collections with music, rather than collections of words’. For historians of music this emphasis on musical collections is to be welcomed. McAulay takes a careful chronological approach to setting out her arguments, thus presenting the reader with a manageable amount of information in each chapter. Overall, the period under discussion is given as 1760–1888, defined by the activities of Patrick MacDonald and James Macpherson in the early years up to the death of William Chappell in 1888. At the outset, we are introduced to three song collectors from the mid-seventeenth century, the MacDonald brothers, Joseph and Patrick, and James Macpherson, who are positioned clearly within the context and collectors’ ethics of the day. The discussion focuses mainly on the actions of Macpherson in producing his collection of Ossian poetry, and includes a detailed investigation of the methods leading to its creation, the fall-out of subsequent critical analysis, and the official inquiry by the Highland Society of Scotland. Chapter 2 brings us to the collections of c.1780–1800, produced amid concerns that ‘the songs were rapidly disappearing’ and therefore required to be committed to print. There is a helpful tabular listing of the works to be considered in this chapter; a similar listing of inter-relations would have helped with Chapter 1. There is a detailed discussion of Robert Burns’s contribution to the Museum, but there is a lack of examples illustrating the extent of his revisions and ‘further sanitized’ texts to help the reader appreciate his actions and their consequences. Having said this, students using this as a course book will find value in the survey of the different approaches towards the texts by, for example, James Johnson, whom we are told wished to preserve their Scottish flavour, and George Thomson, who opted for Anglicising the poetry. McAulay compares these with Joseph Ritson’s apparent eagerness to record the song repertory from live performances around the country whilst distrusting the authenticity of the versions he was hearing and being content instead to use the printed versions of the texts. Again, a few more musical examples would be helpful, particularly in allowing readers to compare different attitudes towards providing accompaniments and the dilemma of Scottish versus Anglicised texts. Any undergraduate using this book will need access to a suitably resourced library. Chapter 3 is an introduction to the growth in tourism as a means of cultural engagement and furthering one’s cultural knowledge and professional contacts. The main subject of this chapter is Alexander Campbell and his endeavours through contacts in all social classes to assemble his collection. There is an intriguing description of a volume of Gaelic songs collected by Lauchlan Maclaine of Mull which appears to be in need of further research. Related to this chapter, Appendix 1 provides a table of manuscripts and other documents originating from the Maclean-Clephane sisters, keen players of the harp and collectors of song tunes, that will serve well as the starting point for other lines of research. Although McAulay admits that Chapter 4 may ‘not offer many new insights into [James] Hogg’s activities’ it is still of value to a novice in this field, particularly in the contemporary use of the ‘found’ manuscript as a basis for fakery. The latter is explored with respect to R.A. Smith’s The Scotish Minstrel [sic] and there is clearly scope for further research on this topic. The subject of this chapter continues into the next, where the main song collections are given some context, including an interesting diversion into the symbolism of the bard with his harp and the wild flowers that are the traditional songs of the country, or its hidden treasure. Chapter 6 focuses on William Stenhouse’s Illustrations within a detailed discussion of the contextual notes included in such volumes. There is a useful guide to his working method of compiling notes and the efforts of those who followed—David Laing and John Glen—to retain, update, and correct these as research methods improved throughout the nineteenth century. Chapter 7 moves into the period 1830–50, the age of the song collections for the drawing rooms and teaching rooms of the middle classes, and the work of Finlay Dun, John Thomson, and George Farquhar Graham. Most welcome in this chapter is the inclusion of comparative musical examples across generations of song collectors. Although the layout of the book means that these are not always ideally positioned to make comparison easy, it is exactly what the musical reader requires. Andrew Wighton, his collection and professional contacts, is the subject of the final chapter, and includes a useful biography of the Aberdeen music printer James Davie. 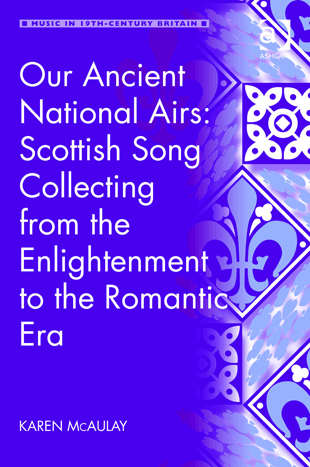 Here McAulay argues for the inclusion of Chappell’s work on English song, and his attempts to claim English origins for some Scots traditional songs, as essential to understanding the strength of nationalism embodied in song collecting. The latter constitutes a significant part of the chapter while noting the further research to be carried out. Appendix 2, related to this chapter, will be a useful starting point for scholars interested in taking this topic further. On the whole, this is a very readable and informative volume. It will serve specialist researchers well as a source for further lines of enquiry, and graduate students with an interest in song collecting in general or the history of Scottish traditional songs in particular. For myself, I think that there are too few musical examples for this volume to serve as a standalone undergraduate set text, although it will work well where the necessary background reference works are available. Dr Elaine Moohan is Lecturer in Music and Associate Dean in the Arts Faculty of the Open University. Her current research examines the musical life of Glasgow from the pre-Reformation Cathedral to the end of the long eighteenth century. She has published OU teaching materials for music students at first-year and specialist honours level, as well as for taught postgraduates.